Erected by Donald Morrison innkeeper Lybster in memory of his daughters. Ellen Morrison died 12th October 1860 aged 12. Sister Catherine Morrison died 21st December 1868 aged 25. Brother John Morrison died 3rd November 1889 aged 57. 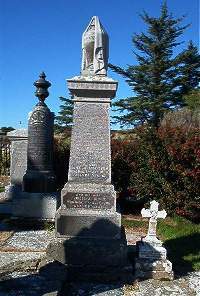 Father Donald Morrison died 17th January 1890 aged 87. Mother Christina Innes died 17th June 1890 aged 86. (Small marble cross placed alongside). Cathie Ella M Sutherland died 27th of January 1884 aged 3. Erected by her mother and brothers.